Everyone at home got very excited when this cute little popcorn maker arrived on our doorstep. 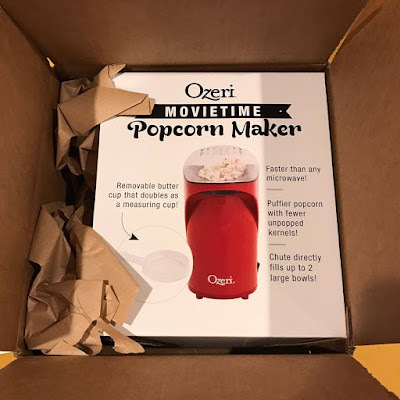 This was sent to me by Ozeri for review purposes. So let's so how this little machine works. When I opened the box, I found the unit rather small. I wasn't sure if this could really make 2 large bowls of popcorn in under 3 minutes. To my surprise, though, it did. This little machine is tough. I love the fact that I can make popcorn with less grease because I get to control the oil or butter that goes in my popcorn. There were also fewer kernels left when I made a couple of batches. You may think it's small, but it's perfect on my counter top. It's not bulky and I can easily keep it inside the cabinet. 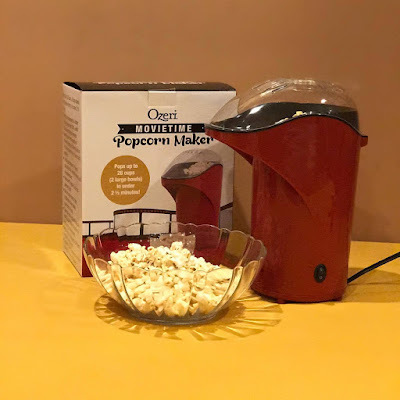 This is a must have item at home if you love popcorn. I love that this popcorn machine is easy to operate, just don't leave the unit unattended or you'll get popcorn all over your place. Save yourself from buying expensive microwave popcorn that is not even good for your health. Make your own and control the amount of butter or oil that goes in there. I highly recommend this. This cute popcorn machine is available at Amazon for only $26.95. Disclosure: I have received one or more of the products mentioned above in exchange for my honest review. I was not paid for my thoughts and opinions. 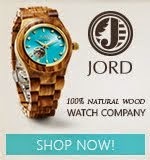 What was written above are 100 percent my own and was in no way influenced by the brand or anyone.